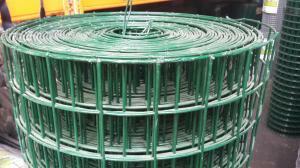 Heavy duty welded wire mesh coated in green PVC that are ideal for strong, long-lasting and tall fencing applications. We stock various thicknesses of PVC coated galvanised wire mesh manufactured from 1.6mm, 2mm, 2.5mm and 3mm diameter wire with mesh apertures of 50x50mm (2x2") and 25x25mm (1x1"). Green PVC coated weld mesh is suitable for gardens and where fencing is required to blend in better with the natural environment. We supply in 90cm, 1.2m, 1.5m, 1.8m, 2.1m and 2.4m wide rolls on 12.5m and 25m roll lengths. Before the steel fencing mesh is coated in the PVC plastic, the welded steel mesh is galvanised. The galvanisation and the PVC coating provides a corrosion-resistant product that is designed not to rust prematurley. PVC coated weld mesh fences are ideal for garden fences, security fencing, dog runs and fox proofing areas. PVC coated welded wire mesh can be fixed using galvanized fencing staples or u-nails and fixed to rounded or square sawn treated fencing stakes. With all our wire mesh fencing products straining line wires should be used and connected to the top, middle and bottom of the fence using hog-rings. This provides tension to the fencing and keeps it taut. We also stock a range of supply our lighter / thinner wire PVC weld mesh fencing that is available in smaller mesh holes.